In this article we summarize the insights we learned from our latest survey on developers problems with Node.js Debugging, Downtimes, Microservices & other pain-points. In the second part of the article, we attempt to provide help with the greatest Node.js issues we discovered. 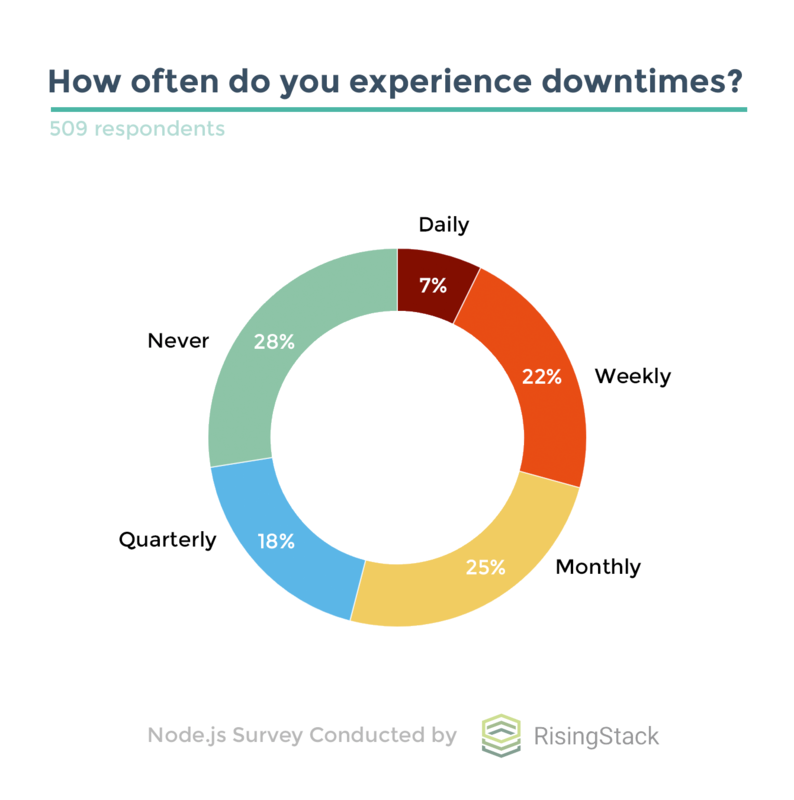 A survey conducted by RisingStack, the company known for its Node.js Monitoring Solution and Node.js Services shows that 1/3rd of Node.js Developers experience downtimes in production systems at least once a week. 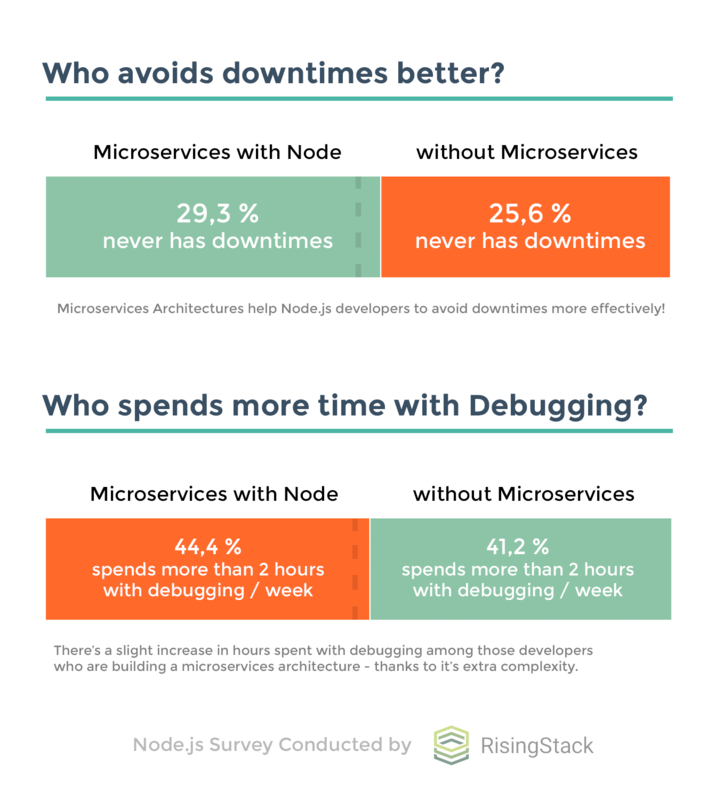 The survey also shows that 43% of the developers spend more than 2 hours a week debugging their Node.js Applications, including the 17% who spends more than 5 hours a week fixing errors in production systems. The survey was conducted via an online form between 13-27 April. It was completed by 746 developers of which 509 claims to have Node.js applications in Production systems. The survey focuses solely on their problems, and this report is based on their answers. The participants of the survey are subscribers of RisingStack’s Node.js Blog, who were asked to participate through email. 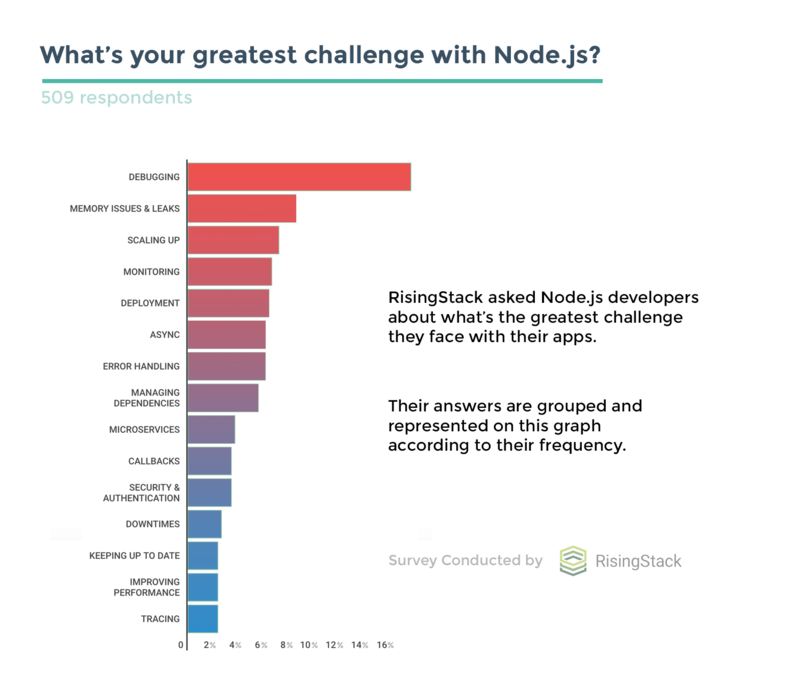 The survey provides valuable insights into the problems Node developers face on a daily basis since we asked them to describe what’s the greatest challenge they face with their applications. The biggest hurdle that developers who use Node.js face is debugging their applications (18% of all respondents). According to the data, nothing comes close to the seriousness of debugging microservices and bugs in production. The second tier of errors contains categories like memory issues (mainly memory leaks), difficulties of scaling & monitoring Node.js apps and getting deployments right (especially in high-scale production systems). There are also problems with Async programming, error handling, and managing dependencies. Each of these problems were pinpointed as the most severe by 6-8% of developers. The third tier of problems are still major ones. Developers mention Microservices (communication, integration, management), callbacks, security (including authentication issues) and downtimes (handling downtimes and restarts) a lot. They also face troubles keeping up with the fast-changing Node.js environment, improving the performance of their apps, and Tracing issues. The last tier of problems named by the respondents of this survey were relatively minor. They include the usage of promises, the lack of standards, the hardship of project structuring, testing & threading. Developers also mention the blocked event-loop, learning Node.js, logging, and configuration as their biggest challenges with Node. How do Microservices Affect Node.js Systems? There’s a slight increase in hours spent with debugging among those developers who are building a microservices architecture with Node compared to those who work on monoliths. 44,4% spends more than two hours with debugging per week, compared to 41,2%. There’s a significant difference in avoiding downtimes if we compare developers with Microservices architectures to the ones we don’t. It looks like that 29,3% of Microservices developers never experience downtimes, compared to 25,6% of developers who do not build a distributed application. Although the data we collected is not representative, it underpins the experience we gained during our consulting & training projects at RisingStack. Building a microservices architecture in an unprepared company can bring enormous complexity on an engineering level and on the management level as well. We see that there are several costly mistakes which developers constantly make, which can easily lead to chaos. We recommend breaking down monolithic applications intro microservices in a lot of cases, but it’s undeniable that finding and fixing bugs in a distributed system is much harder thanks to the myriad of services throwing errors all the time. Experiencing fewer downtimes with microservices is one of the main benefits of the technology since the parts of an app can fail individually (and often unnoticed), keeping larger systems intact. If the data we collected resonates with your Node.js development experience, you might need help to solve your issues. In case you need an agile team who can take ownership of your Node.js projects and help you scale your application, check out our Node.js Consulting & Development Services! 29,27% of Node.js developers experience downtimes in production systems at least once a week, 54,02% at least once a month. 27,50% of Node developers responding to the survey never experience downtimes. 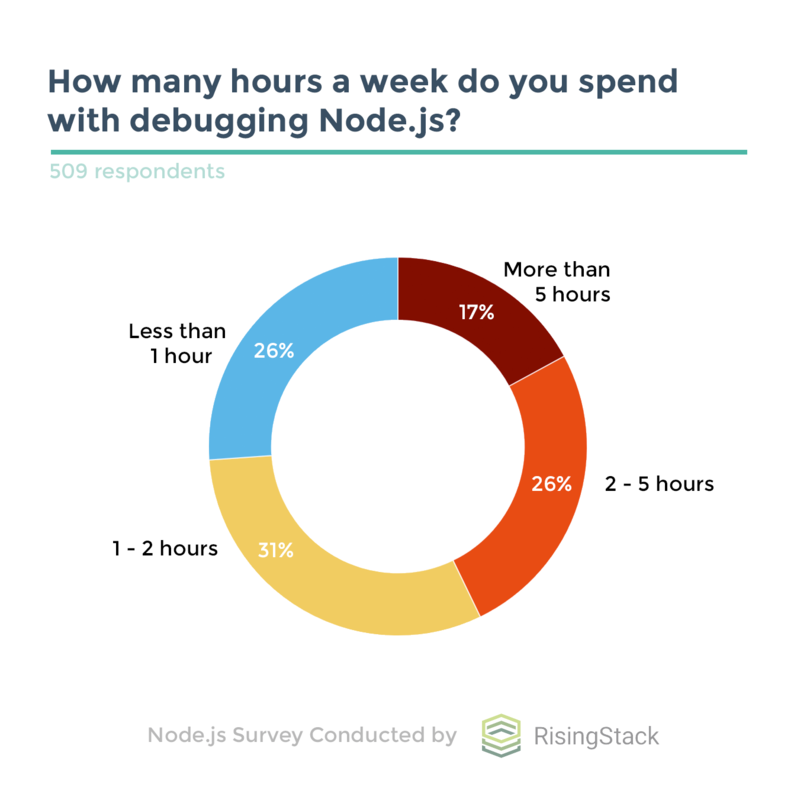 42,82% of the respondents spend more than 2 hours a week with debugging their Node.js applications, including the 17,09% who spends more than 5 hours. The developers building a microservices architecture with Node spend more time with debugging. The advantage of microservices + Node manifests in the form of fewer downtimes.